비로사는 신라말 고려초의 명승 진공대사가 다시 지은 유명한 사찰이다. 이곳에는 2구의 불상이 있는데 원래 광배(光背)와 대좌(臺座)를 모두 갖추고 있었으나 광배는 깨진 채 버려졌다. 높이 1.13m의 석조아미타여래좌상은 원만한 얼굴과 당당한 어깨로 현실적 사실주의가 잘 반영되어 있다. 옷은 왼쪽 어깨만을 감싼 형태이며, 손은 가볍게 주먹을 쥔 상태에서 손바닥을 위로 하고 양 손의 엄지 손가락을 맞대고 있다. 높이 1.17m의 석조비로자나불좌상은 단정한 얼굴과 안정된 신체의 형태로 석조아미타여래좌상과 같이 현실적 사실주의를 잘 나타내고 있다. 양 어깨를 감싼 옷은 얇게 빚은 듯한 평행계단식 주름으로 자연스럽게 보인다. 손은 왼손 검지를 오른손으로 감싼 모양으로 일반적인 석조비로자나불좌상이 취하는 손모양이다. 두 불상은 단아하면서도 선의 특징, 몸의 자세 등이 대체적으로 9세기 후반 석불과 비슷하고, 동시에 나란히 아미타여래좌상·비로자나불좌상이 같이 있다는 점에서 9세기 통일신라 화엄불교의 특징을 보여주는 귀중한 작품이라 하겠다. An ancient historic Buddhist temple restored by an eminent monk Jingong (869-940)) in the Silla-Goryeo transition period, Birosa Temple is enshrining two old stone statues of Amitabha and Vairocana Buddhas. The statues are generally in good condition although they have lost their original halos and pedestals. 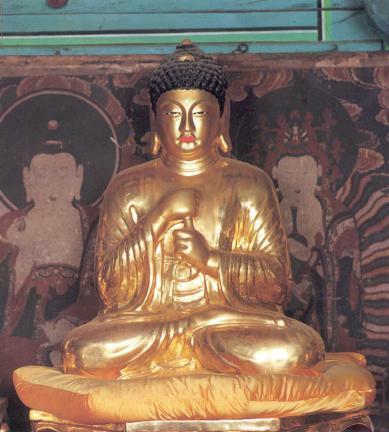 The Amitabha Buddha, 113 centimeters in height, features a benign face and broad shoulders carved in a realistic manner. He wears a robe covering only the left shoulder, has both hands placed on the lap showing a symbolic gesture marked by gently clenching fists with the palms upward and the thumbs touching each other. The Vairocana Buddha, 117 centimeters in height, exhibits equally a benign face and well-proportioned body in a stable seating posture, all realistically depicted. He is in a robe covering both shoulders with many folds running parallel and rendered more or less symmetrical, and displays a symbolic hand gesture with the right hand covering the left index finger, showing that he is Vairocana. Both Buddhas share the characteristic features of the stone Buddhist images of the late 9th century with elegant lines and stable posture. The rendering of Amitabha and Vairocana existing at the same time and in the same place shows a unique feature of Avatamsaka Buddhism of Unified Silla in the 9th century.